The words "liquor" and "liqueur" are so similar that it is easy to confuse the two. Although both are distilled spirits that contain alcohol and are crucial ingredients when mixing cocktails, the liquids are not the same and the terms are not interchangeable. Generally speaking, liquor is not sweet, while liqueurs are. However, many liquors are available in flavored forms, which just adds to the confusion. Liquors are the basis of a drink while liqueurs are mainly used as flavoring agents in mixed drinks (but many can also be enjoyed on their own). Liquor, also known as spirits, is an alcoholic beverage made of grains or other plants that are fermented into a potent drink. Though a few others fall into this category, it's generally accepted that six types of distilled spirits are liquors: brandy, gin, rum, tequila, vodka, and whiskey. The distillation process, which occurs after fermenting, separates the water from the alcohol. This process increases the alcohol content of liquor to at least 20 percent alcohol by volume (ABV). Brandy, rum, tequila, and vodka are generally 40 percent ABV, while whiskey usually ranges from 40 percent to 55 percent ABV. Gin can range from 37 1/2 percent to 50 percent ABV. Liquors are the base of cocktails and mixed drinks and are also very often drunk on the rocks and neat. Think gin and tonic, scotch on the rocks, rum and Coke, and seven and seven, as well as the martini, Manhattan, and old-fashioned. And when people do shots, the shots are often straight liquor. When liqueurs and other mixers are added to these popular party drinks, they are technically considered a shooter. Although sugar is generally used in the fermentation process, the resulting liquor does not taste sugary sweet. And even though liquors are available today in flavored forms, such as citrus and cinnamon, they are not sweet to the palate. The flavor is usually added after distilling through a steeping process, much like how vinegar and oils are infused. The exception to this rule regarding flavored liquors is whiskey. The regulations that cover the various styles of whiskey often state that when any additive—flavoring or sweetener—is added to a whiskey, the whiskey must be classified as a liqueur. 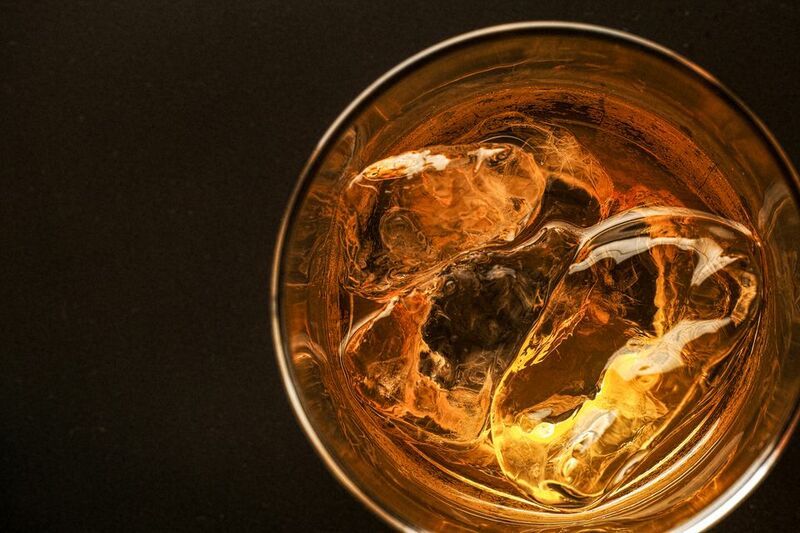 You will often see "whiskey liqueur" in fine print on cherry bourbons, apple whiskeys, and the like. Some of these—as well as some flavored brandies—actually have sugar added as well. Technically, liqueurs are liquor because they are distilled spirits. The general difference is that liqueurs are sweetened spirits with various flavors, oils, and extracts added; rum, whiskey, brandy, and other liquors can serve as a base spirit for liqueurs. In the past, liqueurs were referred to as cordials, and many have a history that stretches back centuries because they were often used medicinally. For example, popular herbal liqueurs—including Benedictine and Chartreuse—were originally created as remedies for various ailments, often by monks who specialized in alchemy. The alcohol content of liqueurs tends to be lower than liquors because of the additives, but this is not always the case. They can range from a low 15 percent ABV (30 proof) to a strong 55 percent ABV (110 proof), so potency is not a distinguishing factor. Liqueurs are used in a wide variety of creative and legendary cocktails. They are the ingredients that usually make the drink extra special. Most can also be enjoyed neat, chilled, or on the rocks. Liqueurs have a wide range of flavors, from coffee to almond to orange. There are also cream liqueurs, like Baileys Irish Cream, and crème liqueurs, which are much sweeter and likened to a potent syrup, like crème de cacao. Grand Marnier is a delicious example of an orange liqueur. It is an ingredient in classic cocktails such as the whiskey daisy and makes a flavorful addition to many recipes. It's also a delight when sipped as a nightcap in hot tea. Other well-known liqueurs are amaretto, Chambord, Cointreau, crème de cassis, crème de menthe, Irish cream, Kahlua, and the variety of flavorful schnapps, to name just a few. Some are brand names and use exclusive recipes, while others are made in a style with a signature flavor that are produced by different companies.